Good guys don't always wear white! 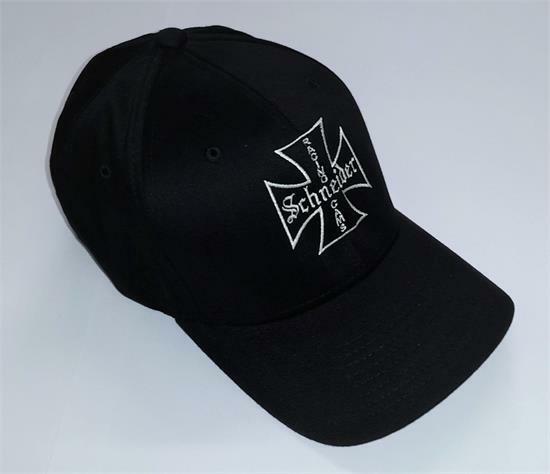 Our classic, low crown, black ball cap is expertly embroidered with the Schneider Iron Cross. Descriptions of the various styles are found below. -Original adjustable ball cap is one size fits most and adjusts with a metal enclosure on the back. -Mesh Back Trucker cap has a mesh back to keep your head cool and is one size fits most with a standard plastic snap enclosure. -OttoFlex SM/MED is a premium low crown flexfit style cap. It has "Schneider" embroidered in Olde English on the back of the cap, as well. -FlexFit LG/XL is a premium mid crown FlexFit cap. It has a white underside to the bill and the back is blank. -Checker Flamed cap will lookk great on race day. It is one size fits most and has an adjustable velcro strap.